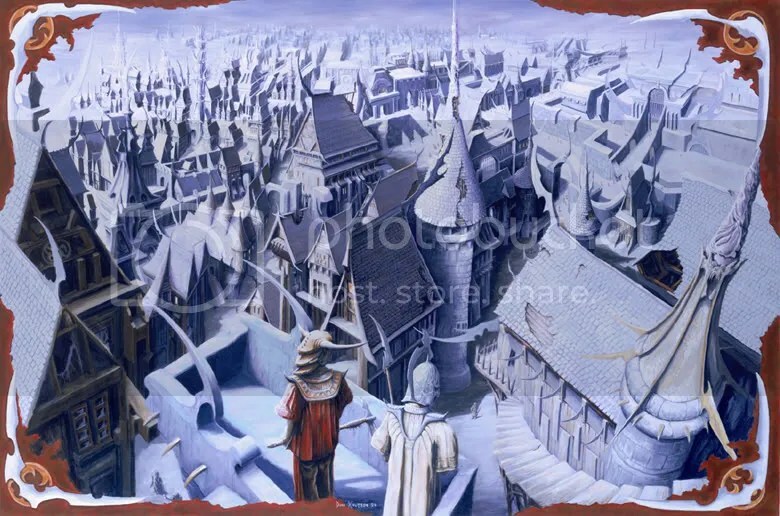 The officers of Boccob’s Barge spent the next several hours poring over Murlynd’s library and holding the stirrup in various ways (and by various people) trying to get the door through which they entered the house to led back to Greyhawk. Unfortunately, their efforts were in vain and they decided to explore the surrounding countryside for another option. As they began their reconnaissance, they discovered that neither their levitation, nor their flying magic worked. Once outside, they followed the path down to a garden. Divided into four plots, the center of the garden was dominated by eight foot tall glittering flowers. They decided to avoid that section of the garden, in case there was a guardian of some sort, and headed toward a hill just south of the house to get a better sense of their surroundings. Atop the hill, they could see the whole area was covered by forest. To the south, was an odd field, arranged into alternating plots of trees and clearings with streams dividing them into a grid, or a checkerboard. An unsettling sense overcame them as they stood on top of the hill. When they descended, whichever direction they traveled was the opposite in which they intended. Straxius tried the novel approach of running in his intended direction, tumbling down the hill toward the checkerboard. Upon seeing him arrive at his desired location, the rest of the heroes also chose to tumble down the hill toward the checkerboard. Somewhere, in the distance, a faint refrain of “As you wish…” could be heard. The plots of the checkerboard field were far larger than they first appeared. The crew could tell there were creatures milling about in each of the square plots, but were unable to positively identify any of them due to the distances involved. After fighting their way through a couple of the fields, a griffon descended onto the field, demanding they stop. They weren’t playing the game right, and Gamemaster Griffon demanded they leave immediately. Straxius and the others asked the griffon where they were, exactly, and how to return to Greyhawk. Gamemaster was unable to help them and suggested they seek out other denizens of the realm. After knocking the heads together of a pair of incessantly arguing twins and the clueless chirpings of a Jub-Jub bird, they finally found their way out of the overgrown forest to a beach. There, they saw a man and a bipedal walrus walking down the beach talking about clams and the relationship between shucking clams and organized religion. Despite their proclivity for distraction, the Walrus and the Carpenter did, indeed, know a way back. They Way Back, they said, just needed the proper key. Unfortunately, someone tossed it in the ocean in a fit of drunkenness some time ago. They knew where the box was, though, but it was near an ill-tempered, giant clam. With a bit of help from Sumner’s spells, Veya was prepared to dive to the clam beds to retrieve the key. The Carpenter lent the crew his row boat and showed them where the clam beds were. It didn’t take long for Veya to retrieve the box and, as promised, contained within was a tarnished brass skeleton key. The Carpenter explained they needed a door for the key to work. A key for a door couldn’t work without one, after all. Straxius obliged by conjuring a door right there on the beach. When they opened it in proximity to the key, they saw a crowded, dingy alley beyond. The Carpenter warned it was one-way. The sight of an abashai pushing its way past them and entering the tavern hammered home Straxius’s suspicion. Not only were they nowhere near the city of Greyhawk, they weren’t even on the Prime Material Plane anymore. They made their first priority finding someone to restore Straxius’s youth, before the ghost’s effect on him became permanent. The barkeep pointed them towards a barely-sober patron. While he was barely coherent, he was more than happy to use some of his restorative magic before asking for payment, realizing after the fact that he should have negotiated for payment before casting the spell. Then, he passed out in his ale. No one in The Way Back was interested in helping them return to Greyhawk; knowledge of one particular portal to one particular place was hard to come by. They went back out to the main street to take stock of their surroundings. City stretch out as far as they eye could see, looping up and around them in a never-ending loop of ever-changing urban jungle. The good news was there was surely a portal home somewhere. The bad news was they were clueless berks in Sigil, the City of Doors….